Do you have a powerful message you need to get out to the world? Do you want to develop the confidence and professional skills you need to become a confident speaker and deliver your message to audiences across the world? Do you need to know how to confidently speak to the media, be interviewed on radio or TV and create messages powerful enough to attract journalists’ attention? 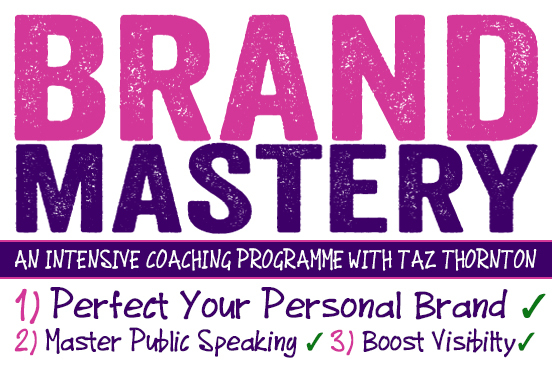 If you really are ready to take that next step and invest in powerful development for you and your brand, Taz’s intensive ‘Brand Mastery’ mentoring options are perfect for you. To cut through all the noise in today’s content-heavy world, you’ll need to know who you are inside and out and be really clear about your story. The first step of the programme looks at everything that led you to this point and works to develop your story so far, including those golden nuggets that can be turned into powerful elements of your journey. On this step of the programme, we use all we’ve learned from step one to create the key message that will form the centre of your personal brand moving forwards. We’ll work on your confidence in that message to ensure you’ll be comfortable and at ease taking it to your audience. This is where we work to really drill down and zone in on your audience. We’ll work out your ideal client avatar and the perfect demographics to target with your message, looking at where they hang out and how to get you in front of them. We’ll work on developing your personal brand, so you are able to live and breathe it with ease. We need you to be inextricably connected to your key message and to be seen as a credible voice of authenticity. This is where we get you to the point of allowing yourself to shine and be seen. Now we’ve mastered the first four steps, we’ll begin to work on your signature presentation. We’ll work together to create a powerful 45-minute presentation, including options to reduce down to a 20-minute presentation, depending on your platform. On this final step of the programme, we’ll take you from concept, to script, to flash cards with the ultimate aim of being able to deliver your presentation without the need for visual prompts. We’ll work on your delivery, your body language, your stage presence, your confidence and even how to generate audience participation and how to address comments and questions from the crowd. The Brand Mastery programme is an intensive mentoring regime over six months. It includes weekly Skype meetings, two half-day face-to-face transformation sessions and online support for an additional six months after the conclusion of the programme. INVESTMENT: Your investment for the six month intensive programme PLUS a further six months of support is £4,500, with instalment plans available by arrangement. For those with an urgent message to take to their audience, there is an option to take the Brand Mastery Fast Track programme. The Brand Mastery Fast Track Intensive gives the option of working face-to-face with Taz over four full days. Your programme will take place at a hotel, where you will carry out your work together in a private meeting room, ensuring you walk away with a powerful message, stage ready and full of confidence. The programme includes online support for an additional six months. FAST TRACK PROGRAMME INVESTMENT: Your investment to perfect your message and attain brand mastery in less than a week is £10,000, payable with a 50% deposit and two further instalments of £2,500. Alternative instalment options may be available subject to agreement. Once you have attained Brand Mastery, you might want to consider bolting on the Media Mastery programme. After all, if you’re all fired up and ready to go, you’ll likely attract media attention and – at the very least – you’ll want to learn all the tricks of the trade for generating your own positive PR. Media Mastery allows you to work 1-2-1 with Taz to learn how to successfully handle interviews for print, TV, radio, podcasts, blogs and vlogs, as well as learning how to create opportunities to drive your own PR through social channels, media contacts and news jacking. Includes half day face-to-face coaching, three Skype coaching sessions and online support for an additional six months. I'm interested in Brand Mastery! Please call me. Fill in your details and we'll contact you to arrange a no obligation Brand Mastery exploratory call. We'll talk about the programme in more detail, decide if it's the right coaching plan for you and work out the best way to advance you and your brand.